Thank you for your interest in the Bookmans ESP Giveaway. Our winner will be announced on January 27, 2016. When Bookmans wanted to add a new line of electric guitars to our vast array of instruments for sale, we looked for a brand that fulfills the needs of our vast array of customers. We need guitars for the metal player, the new hippy blues guy, the three chords and a pop song gal, the future rock star, the jazz girl, the “my wife won’t let me buy a sports car” guy and, of course, the seasoned performer. We want instruments with classic good looks as well as plenty of cutting edge design and the latest tech. We have “Made in the U.S.A.” and imports to fit any budget. Most of all, we want reliable guitars that play great and sound fantastic. We chose ESP Guitars. We like them so much we think you should have one. ESP agrees and so together we offer you a chance to win one in our ESP Giveaway. 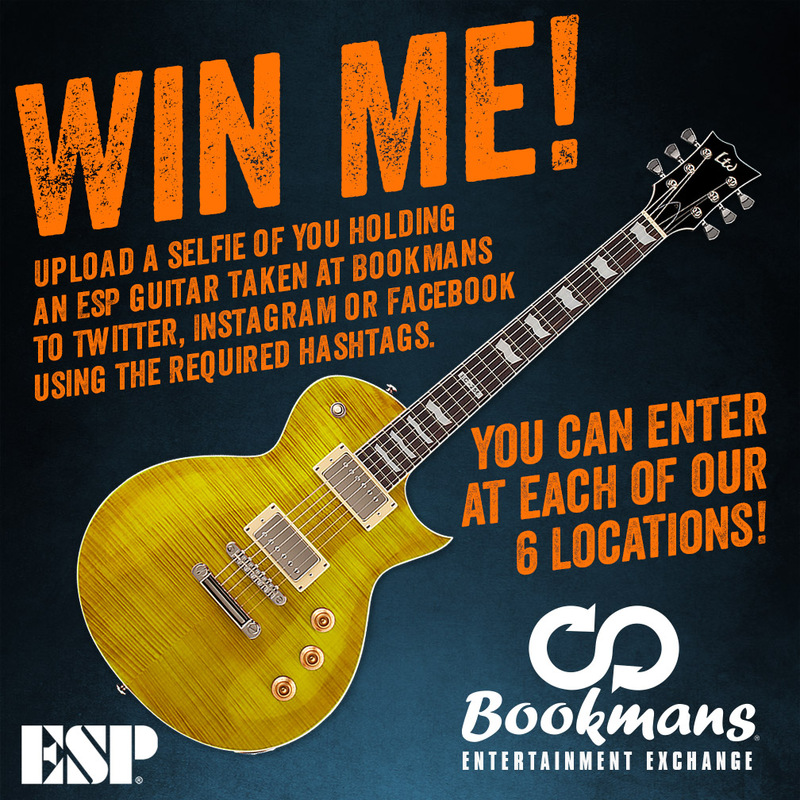 Take a selfie with any of our ESP guitars and Tweet, Facebook or Instagram your photo using the hashtags #ESPgiveaway plus #Bookmans(location) during the promotion period. The promotion period is from January 12 through 20, 2016. For example: If you are at Bookmans Grant in Tucson, you would use #ESPgiveaway and #BookmansGrant when you post your photo. Can I enter if I don’t have a Twitter, Facebook or Instagram account? Sure, ask your grandma if you can use her account. You’ll quickly realize that even your grandma has a Facebook account. The ESP Giveaway requires the use of one of the platforms listed. All three of these platforms provide free accounts that you can enjoy on your desktop, tablet or smart phone. C’mon, it’ll be fun! You may enter one selfie per Bookmans Entertainment Exchange location. We have six entertainment exchanges, so that’s six entries. The ESP Giveaway winner snags a brand new EC-256 Lemon Drop electric model with ESP’s emphasis on quality and craftsmanship. ESP has been making guitars since 1975 and has plenty of guitar and bass models. However, we’re just giving away the one. Check out the photo in the poster. It’s gorgeous. If I win, how do I claim the guitar? We will contact you via the platform you submitted your entry. You will have 2 weeks to get back to us. Once we connect, you can pick up the guitar at the Bookmans of your choosing. * Bookmans has the right to adjust or shut down the contest at any time and the right to investigate possible cheating or tampering before we determine a winner. * Bookmans and ESP aren’t responsible for lost entries due to errors with the platforms, connectivity or any other reason. By participating in the ESP Giveaway, entrants agree to abide by these Official Rules, disclaimers, eligibility requirements and other fine print, and understands that the giveaway results, as determined by Bookmans, are final in all respects. The contest is subject to all federal, state and local laws and regulations and is void where prohibited by law. We aren’t kidding around here. This promotion is in no way sponsored, endorsed or administered by or associated with Twitter, Facebook or Instagram. Any questions, comments or complaints regarding the promotion will be directed only to Bookmans. The ESP Giveaway is open to people fourteen (14) years of age or older at the time of entry who have Internet access and a valid Twitter, Facebook or Instagram account for the duration of the contest period. Neither Bookmans nor ESP employees are eligible. Direct family members of Bookmans or ESP employees are also not eligible. Bookmans has the right to verify the eligibility of each entrant. The giveaway begins at noon Mountain Time Zone as we recognize it in Arizona on January 12, 2016 and ends at noon MST (no DST) on January 20, 2016. All entries must be received within the time stated. Bookmans reserves the right to extend or shorten the contest at our sole discretion. 1. Locate the physical ESP guitar provided for the purpose of the ESP Giveaway at a Bookmans location and take a photo with the guitar. This does not have to be a selfie, but the entrant must be included in the entry photo with the ESP guitar. 2. Upload the image to Twitter, Facebook or Instagram using the hashtags #ESPGiveaway AND a hashtag for the store location (#BookmansGrant, #BookmansSpeedway, #BookmansIna, #BookmansMesa, #BookmansPhoenix or #BookmansFlag). BOTH hashtags must be used for the entry to be eligible for the ESP Giveaway. Only one social media account per entry is allowed. A maximum of one entry per store location is allowed for a total of six possible entries. Any duplicate entries (e.g., multiple photos in the same store, one photo uploaded to multiple accounts) will be discarded and may cause disqualification. All eligible entries received during the submission period will collected. A winner will be chosen at random. The winners will be announced on or about noon MST (no DST) on or about January 27, 2016. Announcement and instructions for prize will be direct messaged to the social media account from which the photo was posted. You may have to follow Bookmans on that platform in order for us to send you a direct message. Each entrant is responsible for monitoring the account from which the ESP Giveaway photo was posted for prize notification and receipt or other communications related to this giveaway. If a potential prize winner cannot be reached by Bookmans within fourteen (14) days, using the contact information provided at the time of entry, or if the prize is returned as undeliverable, that potential prize winner shall forfeit the prize. Upon the request of Bookmans, the potential winner may be required to return an Affidavit of Eligibility, Release and Prize Acceptance Form and IRS W-9 form. If a potential winner fails to comply with these official rules, that potential winner will be disqualified. Prize may not be awarded if an insufficient number of eligible entries are received. An ESP EC-256 Lemon Drop electric guitar retailing at $570. Terms and conditions may apply. Incidental expenses and all other costs and expenses that are not specifically listed as part of a prize in the official rules and that may be associated with the award, acceptance, receipt and use of all or any portion of the awarded prize are solely the responsibility of the prize winner. ALL FEDERAL, STATE AND LOCAL TAXES ASSOCIATED WITH THE RECEIPT OR USE OF ANY PRIZE IS SOLELY THE RESPONSIBILITY OF THE WINNER. No substitution or cash equivalent of prizes is permitted. Bookmans and ESP are not responsible for any typographical or other errors in the offer or administration of the ESP Giveaway, including, but not limited to, errors in any printing or posting of these official rules, the selection and announcement of any winner or the distribution of any prize. Any attempt to damage the content or operation of the ESP Giveaway is unlawful and subject to possible legal action by Bookmans. Bookmans reserves the right to terminate, suspend or amend the ESP Giveaway, without notice, and for any reason, including, without limitation, if we determine that the giveaway cannot be conducted as planned or should a virus, bug, tampering or unauthorized intervention, technical failure or other cause beyond Bookmans’ control corrupt the administration, security, fairness, integrity or proper play of the ESP Giveaway. In the event any tampering or unauthorized intervention may have occurred, Bookmans reserves the right to void suspect entries at issue. Bookmans and our respective parent, affiliate and subsidiary companies, agents, and representatives, and any telephone network or service providers, are not responsible for incorrect or inaccurate transcription of entry information, or for any human error, technical malfunction, lost or delayed data transmission, omission, interruption, deletion, line failure or malfunction of any telephone network, computer equipment or software, the inability to access any website or online service or any other error, human or otherwise. By entering the giveaway, each entrant agrees to indemnify, release and hold harmless Bookmans and any organization or people connected to Bookmans, Twitter, Facebook or Instagram, administrators or ESP and their agents, from any liability, damages, losses or injury resulting in whole or in part, directly or indirectly from that entrant’s participation in the giveaway and the acceptance, use or misuse of the prize. Bookmans and ESP do not make any warranties, express or implied, as to the condition, fitness or merchantability of the prize. Bookmans and any organizations or people connected to Bookmans disclaim any liability for damage to any computer system resulting from access to or the download of information or materials connected with the giveaway. By participating, each entrant grants Bookmans and ESP permission to use his/her name, likeness or comments for publicity purposes without payment of additional consideration, except where prohibited by law. Congratulations on wading through all that text. If you still have questions regarding Bookmans’ ESP Giveaway, shoot us an email at info@bookmans.com. Also, if you want an ESP guitar but don’t want to go through figuring out what hashtags to use, come browse our selection. Plug in and play us a tune if you are up to it. We loved your Chewy pic! Thank you for participating in the contest. We posted the ESP Giveaway winner announcement yesterday at: http://bookmans.com/esp-giveaway-winner/. We numbered each entry and used random.org to generate a winning entry number.